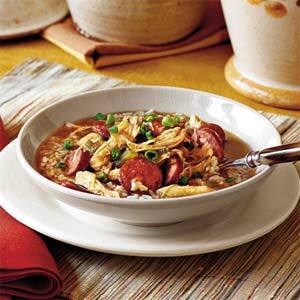 Our Cajun Gumbo & Creole Gumbo recipes are straight from mama’s kitchen. Let us help you create amazing Cajun meals with our healthy Cajun Seasonings. OOWEEH, NOW DAT’S CAJUN GOURMET! Bon Appetit! Gumbo is a stew or soup which originated in south Louisiana. It consists primarily of a strong stock, meat or shellfish, a thickener, and the vegetable “holy trinity” of celery, bell peppers, and onion. 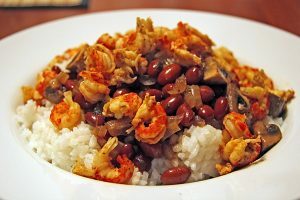 Gumbo is often categorized by the type of thickener used: the African vegetable okra, the Choctaw spice filé powder, or the French base made of flour and fat, roux. There are two main varieties of gumbo. Creole gumbo generally contains shellfish, tomatoes, and a thickener. Cajun gumbo is generally based on a dark roux and is spicier, with either shellfish or fowl. 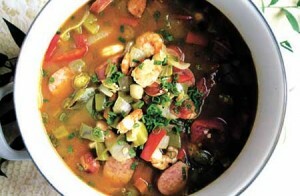 Sausage or ham can be added to a gumbo made with either fowl or shellfish. After the base is prepared, vegetables are cooked down, and then meat is added. The dish boils for a minimum of three hours, with shellfish and some spices added near the end. After the pot is removed from heat, filé powder can be added. Gumbo is traditionally served over rice of dirty rice. A third variety, the meatless gumbo z’herbes is essentially a gumbo of slow-cooked greens sometimes thickened with roux. Gumbo is typically divided into either “Creole” or “Cajun” varieties. Creole gumbo most often consists of seafood, tomatoes, and a thickener. This variety is generally not as spicy as Cajun gumbo, as cayenne pepper is used much more sparingly. Before the latter half of the 20th century, celery was rarely used in Creole gumbo, but it is now much more common. Cajun gumbo is usually identified by its dark roux, cooked until it is a color “a few shades from burning”. The roux is used with either okra or filé powder. Seafood is popular in Cajun gumbo, but the southwestern areas of the state often use fowl, such as chicken or duck, and sausage. The fowl is generally not deboned, and onions, celery, and bell pepper are not strained out of the dish. Cajun gumbo is usually topped with parsley and green onions. Gumbo originated in Louisiana in the 18th century and combines ingredients and culinary practices of several cultures, including French, Spanish, German, West African, and Choctaw. The dish may have been based on traditional West African or native dishes, or may be a derivation of the French dish bouillabaisse. It was first described in 1802 and was listed in various cookbooks in the latter half of the 19th century. The dish gained more widespread popularity in the 1970s, after the United States Senate cafeteria added it to the menu in honor of Senator Allen Ellender. Chef Paul Prudhomme’s popularity in the 1980s spurred further interest in gumbo. Creole refers to the combinations that were traditionally common in New Orleans and southeastern Louisiana. In these areas, significant portions of the population were descendants of settlers from France or Spain, and were known as Creoles. The Cajun combinations were often found in Southwestern Louisiana, which was populated primarily by Cajuns, descendants of the French-speaking settlers who were expelled from Acadia in the mid-18th century. King Of The Cajun offers gourmet Gumbo Filé Powder for all your gumbo dishes. You can use this great Gumbo Filé Powder is you very own Cajun recipe or try one of our Gumbo Recipes. Our Cajun Seasonings and Gumbo Filé Powder has NO MSG as always! OOWEEH, NOW DAT’S CAJUN GOURMET! Bon Appetit!